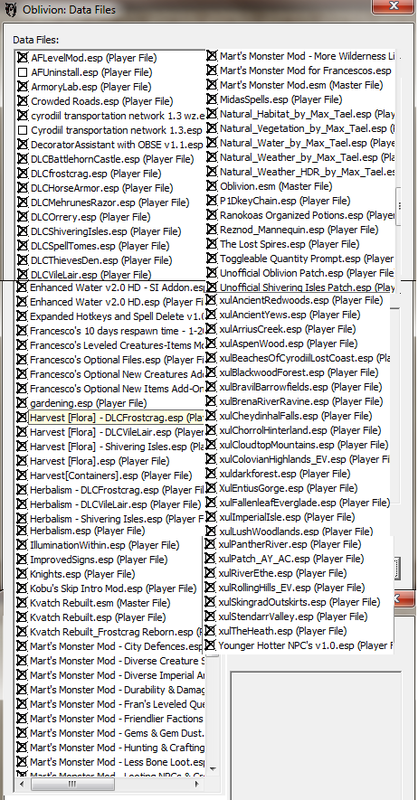 I believe, at this point, that isn't even a complete list of the mods that I've got installed. I want to say some of them didn't require .esp files. I can't be certain anymore. I did some googling for mods initially, and ended up finding a couple places pretty indispensable for building up the new experience I was looking for. Dead End Thrills - Most of my visual mods came from the guide here. It's an awesome guide, put together in far more detail than this write up is, and includes a very helpful section on how to get mods working in general. Each of the recommended mods is discussed in terms of what it provides, and what requirements it'll have for installing. I read through the guide (twice), and hand picked the mods that sounded worth the effort (or performance hit) for me. In the end, I decided I didn't want to deal with the Wrye Bash system, so any mods that required that I skipped. 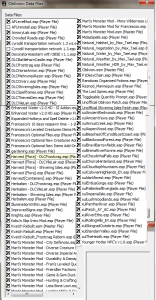 Oblvion Mod Manager and Script Extender aren't much of a pain though, and are pretty indispensible--some of the best mods won't work without them. Post #24 in this thread on NeoGAF - I actually browsed through various Oblivion related threads over there and got some good links from a couple of them, but this post in particular was really helpful with direct links/mod descriptions. Some of the particulars covered there were already installed from Dead End Thrills, as they were visual enhancements. The Oblivion Wiki - I've linked an older version of the important page, since the current one at time of writing is basically empty (vandalism?). In any case, this seemed to fill some gaps I had in my play experience with the previous couple links. Google - As I was playing after installing the interesting ones from above, occasionally I felt the need to mod something else, and wanted to find out if such a mod existed. One example of this was key organization--not controls--I mean keys that open doors. So I googled, and found the Keychain mod that I have installed. There seems to be a mod for pretty much everything at this point, and googling provided me with a number of my more mundane UI-improving style mods (I have a potion stacker too, for example). My Oblivion is now fairly unstable. I get crashes. They are somewhat infrequent, but tend to come in clumps, likely indicating that some environmental mod has destabilized a portion of the world, or an AI/Creature mod has issues with certain creatures. I save often, and travel to a new part of the world when crashes come too frequently, and it generally hasn't been too detrimental. The mods generally make the overworld more dangerous, at least at lower levels. A lot more life, and most of it is a bit tougher than the standard game spawns at that level. Sticking to the roads won't even be enough to keep you safe with the Crowded Roadways mod. On the other hand, more loot? Leveling - The AFLevelMod that I've installed is pretty cool. I didn't dislike the original Oblivion leveling system, but this playthrough wasn't about playing Oblivion again out of the box, so in it went. When you activate the mod, it asks you to configure the way you want leveling to work. I've got mine set so that my abilities rise directly with skill usage, rather than me assigning points to them at level up. Leveling up is largely meaningless for me, at this point, aside from quest requirements. Both Major and Minor skills get to contribute too, just at different rates. There are other options out there, but I'm quite satisfied with the one I ended up with here. Francesco's versus Obscuro's Oblivion Overhaul - These two mods both make pretty large scale changes to a lot of aspects of the game. I did not make an informed decision, as I had installed Francesco's before I stumbled on OOO (and they seemed pretty incompatible, changing the same things in different ways). Now while looking them up, I've found a link to FCOM, which combines them, as well as Martigen's Monster Mod (which I have) and Warcry (which I've never heard of). Apparently they combine well, though the mod isn't final yet. I may have to see if I can make the switch over happen, though I fear save incompatibility. The various Harvest mods are pretty awesome: They provide graphical changes to objects that you loot, so you know you've hit them already (plants and containers both). There is a mod for skipping the tutorial (you warp right outside after the first bit with the emperor). I consider it a must, as the mod process usually involves a couple restarts early on. Kvatch - There are two separate Kvatch related mods, Kvatch Rebuilt and Kvatch Aftermath. Both add content to the town after the early game quests there, which seemed like such an obviously cool questline that I was really disappointed that Bethesda didn't include it in the default game all those years ago. I went with Rebuilt, but haven't been super impressed with it yet. You can't choose both. Midas' Spells - I love this mod. It adds a kind of goofy character, with a sort of crafting chamber and quests that give purpose to the useless jewelry loot you'll get. They can be used to create new spells. Some of these spells are awesome. I love that you have to craft/earn them first too. His house is in the Mage Guild area of Imperial City, but not behind the gates, so you can start on this content before you've gotten approval from all the guild leaders. The Lost Spires - Out of the various "new content" mods, this is the best one I've got installed. Make sure it ends up low (last?) on your load order in the mod manager, or you can't get into the first dungeon if you've got the same mods as me. Toggleable Quantity Prompt - How many of X would you like to buy/sell? How much would you like to not have to deal with that freaking slider? I thought so. This mod rocks. This entry was posted on Monday, August 23rd, 2010 at 12:39 pm	. You can follow any responses to this entry through the RSS 2.0 feed. Both comments and pings are currently closed.